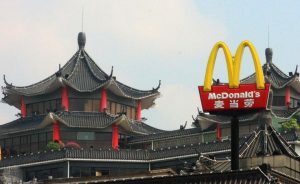 McDonalds Corp announced that it would nearly double the store count it currently has on China’s mainland by 2022. That is slightly higher than had been expected, as part of the burger chain’s strategic partnership with CITIC Ltd the conglomerate that is state-backed and the Carlyle Group. Earlier in 2017, the fast food giant based in the U.S. agreed it would sell the majority of its business across China as well as Hong Kong to CITIC and Carlyle for the price of $2.1 billion. That new partnership planned on adding over 1,500 restaurants over the upcoming five years in those two areas. However, McDonald’s, which has bet the partnership will help expand the brand in the No. 2 economy in the world without needing to use its own capital, announced that it expects to increase the store count on China’s mainland by 2022 to 4,500 from its current 2,500. McDonald’s said its target for growth in annual sales was in the double digits for mainland China during that period, and was looking to increase store count by 500 each year through 2022 versus the 250 stores it is adding this year. McDonald’s CEO Steve Easterbrook said that China will soon be the largest market beside the U.S. and the company is excited to be joining forces with Carlyle and CITIC for better decision making at the local level to meet the constantly changing demands of customers. Under its deal with the two companies, which last week was given regulatory approval, CITIC holds 52% while Carlyle has 28% of the Hong Kong and China McDonald’s business. The burger chain giant said it was aiming to open more of its restaurants in cities in China that are lower-tier, boost its capacity for delivery and introduce a personalized and digitalized dining experiences to more customers in China. Menu innovation is to be one of the key focus points for the new partnership. Firms in the fast food sector including McDonald’s as well as Yum Brands, the owner of Pizza Hut, Taco Bell and KFC, have been recovering from a number of scandals related to food supply across China that undermined the overall performance of their restaurants. Add to that the increased amount of competition from both multinational restaurants and local Chinese restaurants and one can quickly see that it is difficult to grow let alone maintain market share.